For many senior leaders, promotion is just the start of a whole new set of unexpected challenges. There are executive leaders to please and junior leaders to lead. Many for the first time are asked to work on multiple teams with peers who have competing priorities. They might now be responsible for areas of the organization in which they don’t have technical expertise.Some senior leaders seem to have advanced through the sheer force of driving results, often at the cost of high employee compliance and burnout. Others appear to have attained senior roles through the influence of their charismatic personality, without producing much in the way of sustained business outcomes. Too many leaders are promoted because of what they know or how long they have worked, rather than their skill in managing others. As the complexity of the senior leader role increases and the consequences of a leader’s behaviors are multiplied, how can one successfully make the transition to senior leadership? What does it take to succeed at that level? Unite! 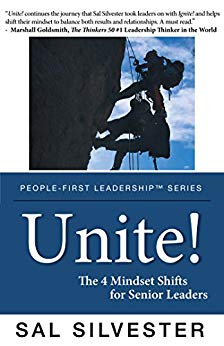 The 4 Mindset Shifts for Senior Leaders explores the four shifts in mindset that help a senior leader balance both results and relationships so they can ultimately unite the people around them. Audiences will walk away with new insights and distinctions of how to transition successfully into senior leadership roles. Senior leaders will learn to fine tune how they function with their team and other senior leaders and to build a strong succession framework.